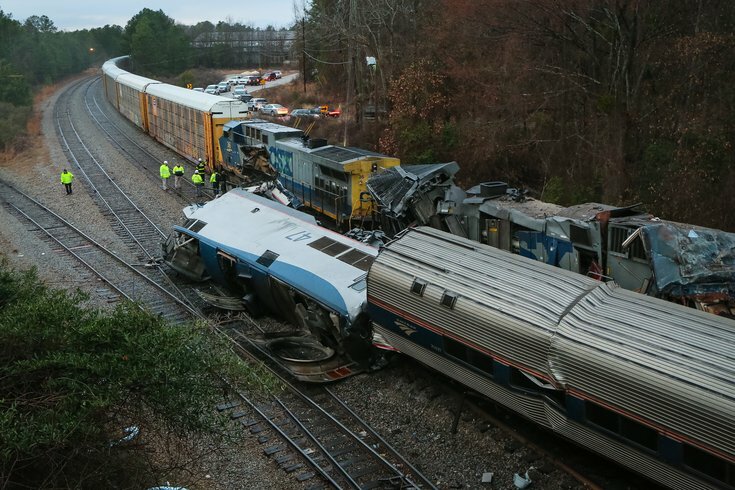 The scene on Feb. 4, 2018 after an Amtrack train crashed into a CSX frieght train in Cayce, S.C. The engineer and conductor were killed. Several Philadelphia lawmakers are expressing concern over President Donald Trump’s call for Amtrak budget cuts, despite several fatal accidents that have occurred in recent years. Trump’s budget plan proposes cutting $128 million from the federal subsidy that aids Amtrak’s entire Northeast Corridor, which services Philadelphia and many other cities. In total, the budget would cut the entire Amtrak budget in half. Elon Musk gets approval to start digging Hyperloop in D.C.
Several lawmakers have expressed concern over the proposed cuts, highlighting the train’s role in cutting car traffic and acting as a more environmentally friendly option. Additionally, though Trump’s budget designates $200 billion of federal funds for infrastructure to garner $1.3 trillion in state, local, and private funding, there is concern that even those funds aren’t enough to ensure safety and upkeep. “We need intercity rail service that is safe as well as efficient,” New Jersey Sen. Bob Menendez said. Rail safety hits particularly close to home due to 2015’s deadly Amtrak accident just outside at Frankford Junction in Port Richmond – an incident that has sparked debate not only over funding for transit safety and maintenance but also about how best to qualify train engineers. The engineer during the 2015 derailment, Brandon Bostian, recently had charges of involuntary manslaughter and reckless endangerment reinstated against him for the 2015 crash. Earlier this month an Amtrak collision occurred in South Carolina, the train previously traveled through Philadelphia and was carry at least one passenger from the area. Two passengers died and more than 100 were injured in the accident.